Wolves boss Kenny Jackett admitted it was hard to make excuses for his team after seeing his side suffer a fourth straight Championship defeat. Saturday's 4-0 defeat at Brentford, coming on top of losses at Ipswich (2-1) and Derby (5-0) and a 3-0 home reverse to Nottingham Forest in between, has seen Wolves slip to 12th. 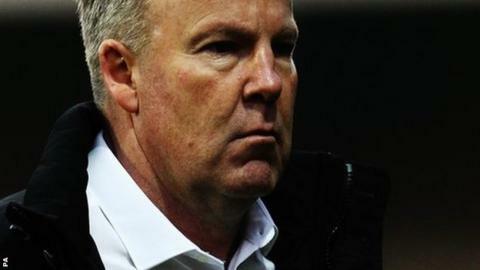 "With a scoreline like that, it's hard to make excuses," Jackett told BBC WM. "The goals against column is poor and we're not scoring down the other end." Wolves have not lost four games on the spin since their seven-match losing run in the Premier League under Terry Connor, following Mick McCarthy's sacking in the spring of 2012. They also suffered consecutive defeats in the final four matches of Stale Solbakken's reign during the 2012-13 season, although the last of those came against Luton in the FA Cup. Following last Thursday's closure of the emergency loan window, Jackett also knows he has to get by with what he has at his disposal for the next five matches, until the transfer window opens on 1 January. "They have to be [the players to end the bad run]," he added. "The window is closed. "Admittedly, we lost Scott Golbourne on his comeback after injury at half-time. But, other than Lee Evans, who's 20, and George Saville, who's 21, we had a very experienced side out there. "Wolves' November slump has been startling. It's easy now to forget that exactly a month ago, on 1 November following the 0-0 draw with Birmingham City, they were briefly top of the table. But their 5-0 defeat at Derby a week later was a thrashing of a particularly high magnitude, and would appear to have had longer-lasting effects than was expected at the time. In the two games since, Wolves have collapsed in the final half-hour. "Kenny Jackett has pulled quite a few levers already, to no effect. He even withdrew Kevin McDonald, the key midfielder, for the first hour on Saturday. Whether he should have been given more levers to pull, before the loan window closed, is a topic of some discussion among Wolves supporters. "He was also surely correct to say that there should have been enough experience in the side he picked at Brentford to stay competitive until the end. But the mistakes Wolves are making at the moment are proving surprisingly corrosive to confidence." "At half-time, it was only 1-0. A close and cagey game. And Rajiv van La Parra's had a positive game. He got plenty of crosses in and was a threat. But the more we opened ourselves up, the more Brentford looked like scoring. "We need to recognise what were doing wrong and do the basics better than we have been, and we'll come out fighting at home to Bournemouth next week."